Challenge: Educate building occupants on energy awareness in their personal environment, and the opportunity to save energy through simple actions. According to recent studies by the Department of Energy, approximately 5% of electricity generated in the U.S. is consumed by powered devices that are not in use. This figure can be as high as 20% in many buildings. Simple tasks such as unplugging unused devices or utilizing the on/off switches on power strips can help reduce this lost energy. The Raleigh Municipal building was a test platform for smart energy consumption for the city. Each floor is metered via Schneider MVP Panels, so plug and lighting loads can be monitored in real time. • Work with the Facilities and Sustainability groups to build awareness for the event. • Develop a new ‘Power Down’ marketing identity for employees to make a connection to the event and provide incentives to participate. 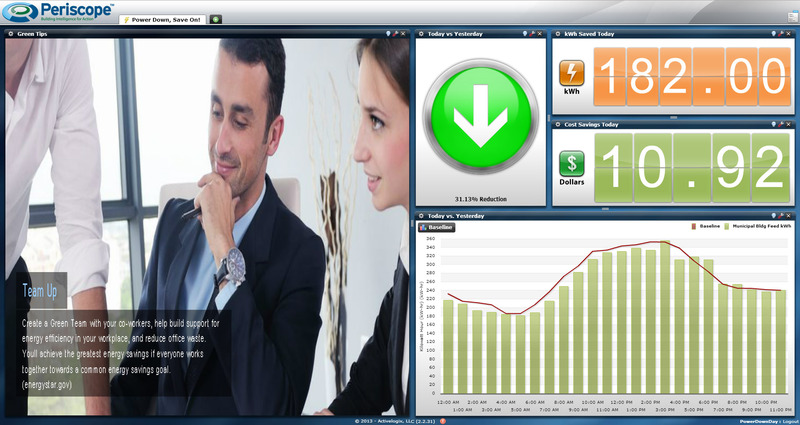 • Utilize the previously installed metering equipment to observe and record savings in real time as the day unfolded. • Display Energy Savings in real-time in heavy traffic areas within the Municipal Building so that employees and visitors could understand the effects of the energy saving actions throughout the day. Activelogix LLC, a Charlotte technology firm specializing in development and delivery of products and services for identification and optimization of energy and sustainability programs took the lead on the project to develop and initiate the Power Down Day event (April 10th). Activelogix tapped into the Municipal building’s plug and lighting energy loads on each floor, and utilized Periscope to display the energy usage and savings data in an easy to use format for building occupants. Custom Greentips to show how each employee could make a difference for the event. Ideas included closing doors, unplugging space heaters, and turning off lights when not in use. Two Baseline Comparison viewlets showing April 10th (Power Down Day) vs. the day prior. One viewlet was presented as a color changing ‘Performance Orb’ to show on the fly color changes that represented the level of savings or loss in a green to red color shifting orb with a directional arrow. The second was a traditional bar chart with a baseline representing the day prior. Update intervals were every hour. A Digital Totalizer viewlet showed the running total of energy savings versus the previous day (April 9th). An additional Digital Totalizer showed the running total of dollar savings for the day of the event (April 10th). The event started approximately around 7am when employees started coming to work, though the data was recorded over a 24 hour period. One day prior to the Power Down Day event, City employees put up posters at key entry/exits encouraging participation. 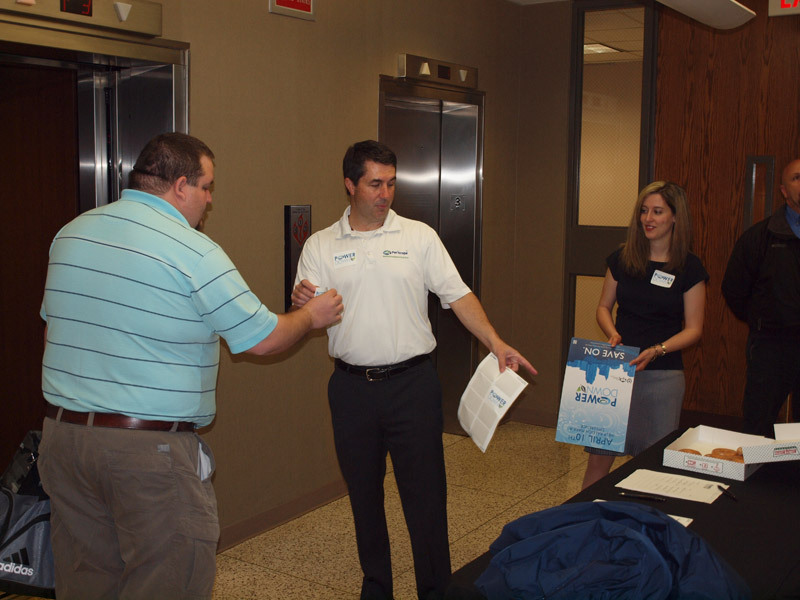 During the event employees were asked to pledge support and provided with stickers to remind them to conserve. Energy Champions were recruited on each floor to provide encouragement to save. In summary, the City realized a 13% reduction in energy consumption over the average daily profile of the prior two days. At the end of the event, the Municipal Building had saved approximately 182 kWh of energy at a cost of $10.92. If similar results could be achieved over 12 months, savings at the Municipal Building could approximate $2,800.00 with no capital outlay. While these savings are not applicable at all 100+ buildings, similar results could create a significant financial impact for the City. Raleigh is the capital and the second largest city in the state of North Carolina as well as the seat of Wake County. Raleigh is known as the “City of Oaks” for its many oak trees. According to the U.S. Census Bureau, the city’s 2011 estimated population was 416,468, over an area of 142.8 square miles (370 km2), making Raleigh currently the 42nd largest city in the United States. It is also one of the fastest-growing cities in the country. The city of Raleigh is named after Sir Walter Raleigh, who established the lost Roanoke Colony on Roanoke Island in present-day Dare County, North Carolina. Raleigh’s commitment to sustainability is central to its vision for the future. Broad and comprehensive, this vision focuses on interdependent relationships between Economic Strength, Environmental Stewardship and Social Equity. These three fundamental principles guide decisions the City of Raleigh makes as a 21st Century City of Innovation. Sustainable communities encourage people to work together to create healthy communities where natural and historic resources are preserved, jobs are available, sprawl is contained, neighborhoods are secure, education is lifelong, transportation and health care are accessible, and all citizens have opportunities to improve the quality of their lives. The purpose of the Raleigh Parks and Recreation Department is to actively encourage, provide, promote and protect quality leisure, recreation and cultural opportunities, facilities and environments that are essential for the enhancement of the lives of our citizens.